State Statute in Violation of the First Amendment and causes a grave injustice by bringing liability upon these organizations. 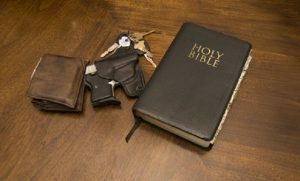 To conceal-carry in church a permit holder must first “get written consent”, this state statute brings a liability burden on religious organizations that intend to allow individuals to conceal-carry. Since this “written consent” directly involves the church, it may then involve the insurance company, some churches have declined to grant consent even though they would have done so if this law was not on the books. This law treats a Church differently than say a business, by requiring a religious organization to grant permission in writing they now are burdened with liability that a business or other organization does not have. It also causes ones right of protection to be violated, even more so here in Wyoming, since even some of our larger churches are not able to afford “paid security” and rely solely on volunteers. Since the end result has hindered the lawful carry of firearms in church, this section of legislation is in direct conflict with Article 1 Section 24 of the Wyoming Constitution …The right of the citizens to bear arms in the defense of themselves… shall not be denied… by this alone it should be clear that the statute in question should be removed. Under the First Amendment of the U.S Constitution, it clearly states “Congress shall make no law respecting an establishment of religion, or prohibiting the free exercise thereof” and lawmakers have a duty to uphold this, the First amendment also includes “or of the press; or the right of the people peaceably to assemble, and to petition the Government for a redress of grievances” and this reminds us that the First Amendment has been universally accepted to protect our rights at the state level. It should be clearly understood that the only intention is to allow churches to be free to make their own choices and communicate “policy” to members, visitors and employees as they choose. This is even true for churches that want to ban firearms, some may want to post a sign and others may want to do so on an individual basis, but it should be their right to make their own choices, the government should not do it for them. By contrast Wyoming business owners and secular organizations make these decisions to allow or disallow firearms everyday without intervention from the government and there is no reason why churches should be singled out. For the government to make church policy is a gross rights violation, a church should be free to make and enforce policy on their own. In WyGO’s opinion, churches have become the target of senseless killings and there is no “one” right way for a church to provide security or allow individuals to protect themselves, again since it involves how people worship, it should be up to these organizations to decide on these matters.